Now in a second edition. The most important improvement is the brand new Chapter 17—”How to design your own training programs.” This chapter reflects Stuart’s six years of additional experience and research. In addition, Chapter 19 has been revised, as have some of the most important sections of exercise technique in Chapter 12. And many other improvements have been made throughout BUILD MUSCLE LOSE FAT LOOK GREAT. With 640 pages and nearly 400 photographs, this bodybuilding guide has an extraordinary quality and quantity of instruction and information, most of it additional to what’s in BEYOND BRAWN. About 200 pages of BUILD MUSCLE LOSE FAT LOOK GREAT (Chapter 12) are devoted to exercise technique, but that still leaves over 400 pages to cover other usable information on bodybuilding and related topics. It includes comprehensive material for beginners, so that they can get started correctly. But the guide is not just for beginners. 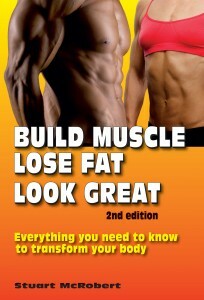 Its guidance is for intermediate and advanced bodybuilders, too, and for men and women of all ages. Use this definitive guide to teach you how to become your own expert personal trainer. Please check out the table of contents and other information listed in the sidebar to discover the breadth and depth of the guidance provided in this comprehensive bodybuilding manual.